This gorgeous stand of French Lavender is now three years old. It was planted late one spring from three of our starter pots. The name French Lavender is sometimes applied to Lavandula stoechas which most sources will call Spanish Lavender. Both are zone 8 plants and both are beautiful but French Lavender blooms a lot longer. As always it is important to use botanic names when buying plants. What a striking complement the Yellow Lavender, with its chartreuse foliage and its creamy beige flower petals, is to the French Lavender. Both lavenders should be pruned well at the end of the season to keep the bushes from becoming unruly and down right ugly. 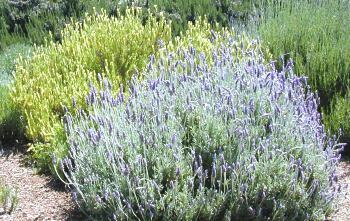 French Lavender is not usually used as a culinary lavender. But, we have had customers who do like to cook with it. And, while it doesn't have that great English Lavender fragrance, it is large and blooms from spring to frost and has a nice clean smell. 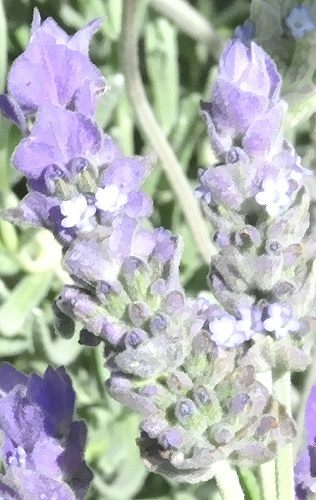 If you look closely at the flower above you can see the actual French Lavender flowers. They are small and pale and cradled in colorful petals called bracts. 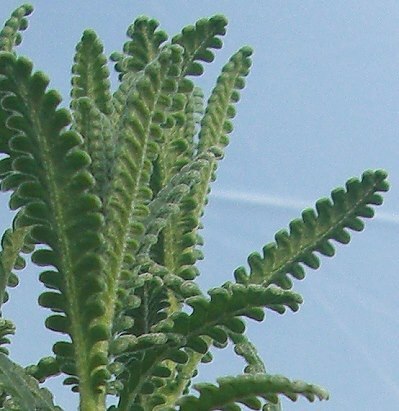 The close up of the leaves shows the scallops or dents on the leaves which refers to the dentata in its botanic name, Lavandula dentata. Literally translated dentata means "toothed". Try Lambikins Dwarf French Lavender for a more petite version of French Lavender. It only gets two feet instead of three or four. Both French Lavender and Dwarf French Lavender are often available in plug trays. This plant is often available in plug trays. These trays hold 128 of all the same plant. They are a great low cost way to fill a lot of space. Each cell is 3/4 of inch by an inch. Check here to see if French Lavender Plug Trays are available. 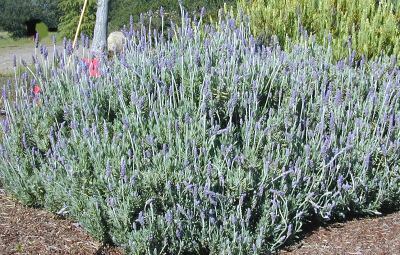 French Lavender is one of the six plants chosen to be in our Zone 8-11 Fragrant Herb Garden Six Pack.